Restore II Advanced Skin Lifting Serum enhanced treatment to instantly tighten and lift skin to create youthful contour on face while in the long run reduces pores, smoothens fine lines and wrinkles, and brightens and lightens complexion at the same time. 2.5% Pepha® -Tight provides perceptible tightening effect on skin and protects skin from oxidative stress. High potency 10% Matrixyl® and 2.5% SYN® -TC are clinically proven stimulants in collagen formation for reducing facial wrinkles and sagging. 4% Caviar Extract and 2% Collagen intensively hydrate and moisturize skin. 10% Kigelia Africana Extract is renowned for firming and lifting face and neck area, with Kojic Acid and Willow Bark Extract for diminishing pigmentation and tightening pores types. 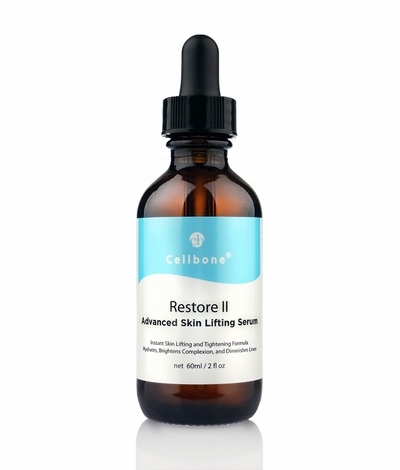 Apply a few drops on dry face, neck and chest twice daily, follow with Cellbone's Hydration Gel and/or Moisturizer of your choice.